A One hour flight from Caracas we find the northern end of the great Andean Chain. 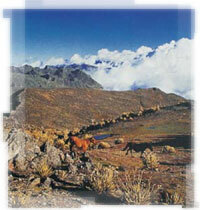 Under the protection of 8 big National Parks and 3 Natuional Natural Monuments and the jealous care of it inhabitants the Venezuelan Andes are the most popular nature & adventure tours destination, offering everything from lush tropical rainforests passing by cloudy forests to permanent snow (locally called Páramos). Anthropologically the mountains, and in general the Andes región, are dotted with small towns whose inhabitants continue the is old the agriculture traditions of their predecessors: the Prehispanic Timoto-Cuica Amerindians. The Meridas Cable-car is the longest and largest in the world, starting at slope of Pico Bolívar mountain ending to Pico Espejo (15.725 feet).